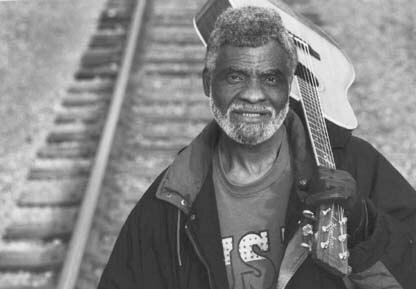 Playing his acoustic Martin guitar and singing with a voice of sandpaper and honey, Ted Hawkins was discovered while earning his living as a street minstrel, a busker on the shores of Los Angeles. His stabs at success started with the 1966 single “Baby” on Money Records, which led to a dead end. Despite critical acclaim for his 1972 album Watch Your Step on Rounder Records—the release earned a five-star review from Rolling Stone’s Dave Marsh—his first success germinated in England over a decade later, when BBC broadcaster Andy Kershaw became Ted’s champion. In the late ’80s Ted relocated to Bridlington, on the northern coast of England, basking in the adulation Europeans have always shown for American roots music. He returned to the U.S. in 1990 looking for the same recognition from his homeland, only to land back on the streets of L. A. as his stage. Then, an astonishing deal with powerhouse major Geffen Records in 1993 led to the release of his first major-label album, The Next Hundred Years. There began his ascent up the “Ladder of Success.” The following year, with a full-force marketing team behind the music, this iconoclastic singer-songwriter began touring the U.S., generating a flurry of adoring reviews for his live performances. Hawkins returned to Europe triumphant in his newfound Stateside success; he then spent three weeks performing in Australia, which pushed the album into the Top 20 on the Billboard charts Down Under. “The Next Hundred Years” marked a resurgence for this emotional singer. His simple, poignant songs cover a divergent life, from escaping the Black South and the mean streets of Los Angeles, to an astounding success story of sheer perseverance. When Ted Hawkins died an untimely death on January 1, 1995 from a diabetes-related stroke, he departed this world leaving behind a body of intriguing songs and recordings.